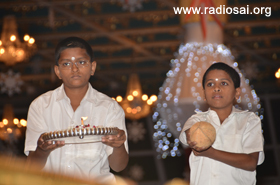 The New Year dawned in Prashanti Nilayam and it was just like any other day. It was welcomed with Veda chanting, Suprabhatam and Nagar Sankirtan in the morning followed once again by Veda chanting and bhajans. 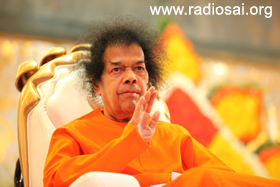 As far as Swami is concerned, every moment is new and He emphasises that one should celebrate every moment as it comes - live in the present for it is truly a present from God. That being said, the day’s programme was special because it was being done by the alumni of the University. A procession of flag bearers awaited Swami’s arrival at the Yajur Mandiram. 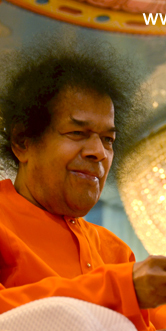 A lot of people had flocked to Puttaparthi to begin the New Year with Swami and the fact that it was the weekend added to the thronging numbers. 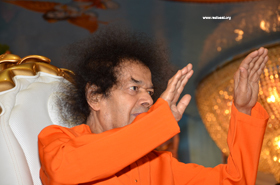 The Poornachandra auditorium was filled to capacity with the overflow from the Sai Kulwant Hall and the spill over from the auditorium had filled the small lane next to East Prashanti. A huge screen had been placed in the auditorium for the devotees to enjoy uninterrupted darshan. 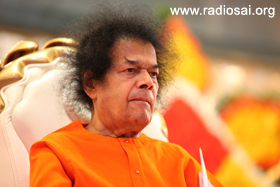 At 7:15 p.m., as Swami arrived from the Residence, He moved first towards the auditorium. 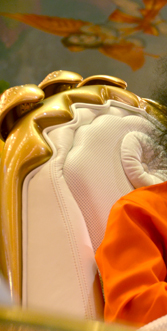 There was glee and supreme satisfaction as all the devotees feasted on the bewitching and beautiful form of Swami. 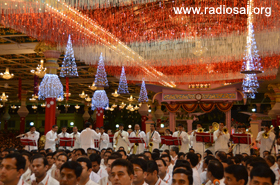 The Lord seemed to be having an inclination to move down the stage and be amidst the devotees but that somehow did not materialise. 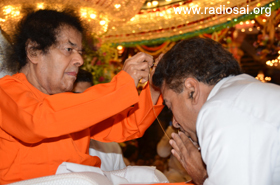 Having granted darshan there, Swami got into the car and moved into the Sai Kulwant Hall, led by the procession of flag bearers, fan bearers and Veda chanting contingent. He took a complete round and as He passed in the front, He tossed a Vibhuti packet to one of the alumni co-ordinators. 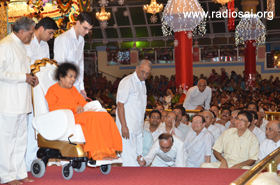 At 7:20 p.m., Swami was on the stage and the bhajans by the students were on. 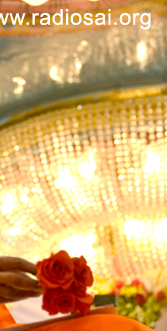 He lit the lamp and accepted the roses offered. 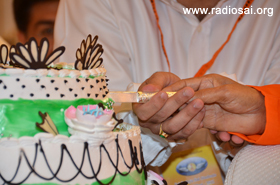 Then, He cut the cake that had been placed at the eastern edge of the stage and finally took His place on the stage facing everyone. He gifted a Vibhuti packet for a photographer seated there and then tossed another for the same alumni coordinator. He then asked for the programme to begin. Carrying over the habit from the Institute days, the students make use of every opportunity to get close to Swami on the physical plane! 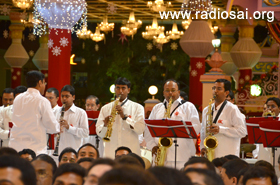 Cloves, cards and flowers were offered before the music programme began with a Ganesha bhajan that was played by the Alumni band. And once the band completed its performance, the individual songs began. These were composed by singers from various eras and thus it was that there was a happy commingling of the elders and youngsters from among the students of various batches. 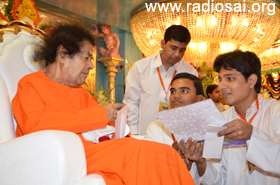 Swami was reading the letters that the alumni had given. This meet was special compared to the previous one for all the family members of the alumni too had been part of it. 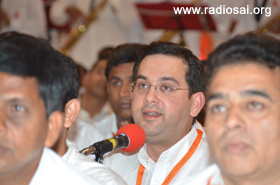 Once a few songs and a really long qawwali had been sung, Swami called a couple of singers and told them to sing bhajans. Immediately, the enthusiasm in the hall went up as everyone now became participants rather than mere spectators. 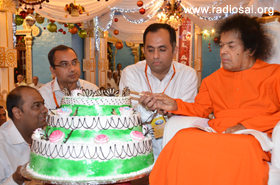 And Swami seemed to be saying that it was in Unity that a New Year should begin. 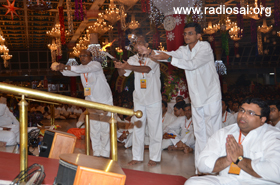 As the bhajans were on, Swami called one of the alumni members of the 1978-81 batch at Brindavan and enquired into his well being. This person’s wife had been ailing with a heart condition and it had remained inspite of a surgery. 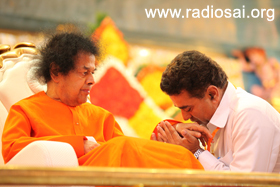 Swami spoke lovingly to him and though he could not catch much of His words, he almost broke down, overwhelmed with love. 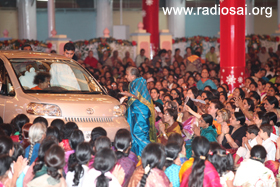 Swami had the camphor waved at Him and then blessed everyone who had gathered in the hall. It was a wonderful abhayahastha on the New Year day. Meanwhile, the photograph of Swami gifting the chain was brought and He had a look at it before handing it over to the alumnus concerned. It was almost 9 p.m. when Swami retired for the day. Dear reader, how do you like this section? Does it help or inspire you in anyway? Please share your reflections with us by writing to [email protected]g mentioning your name and country.